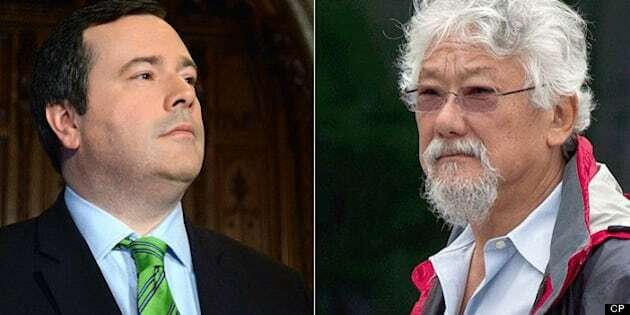 Federal Immigration Minister Jason Kenney has slammed environmental icon David Suzuki for espousing "toxic and irresponsible" views about immigration. Suzuki took aim at the Harper government in an article published last Monday by the Parisian newspaper L’Express, in which he accuses Prime Minister Stephen Harper of doing little to combat global warming. Reporter Jean-Michel Demetz asked Suzuki what he thought about Australian environmentalists who oppose immigration because they do not believe natural resources can withstand population growth. When pressed as to whether that perspective was selfish, Suzuki said he believes Canada still has a responsibility to take in those who cannot survive elsewhere. "Canada should always open its doors to those who are oppressed or in cases of emergency," he said. "When Canada offered refuge to 50,000 boat people in Vietnam in the 1970s, I was particularly proud to be Canadian." Suzuki’s words did not sit well with Kenney, who took to Twitter on Wednesday to voice his displeasure at not only the environmentalist but the media for not covering what he called "extreme anti-immigration views." Suzuki's views are toxic & irresponsible: "Canada is full. Our immigration policy is sickening. Its crazy. There's no more room in Canada. On Wednesday night, Sun News host Ezra Levant lambasted Suzuki, whom he mockingly called a "Canadian saint," for what he described as a weird position from someone who, as a child, was placed in a Japanese internment camp. Levant took umbrage with Suzuki’s arguments against overpopulation when he has five children and three houses. "He’s got a bigger carbon footprint than a whole village in the third world," Levant said. Of course, this is not the first time Suzuki has clashed with a key Harper cabinet minister. In April, Treasury Board President Tony Clement blamed Suzuki and other environmental groups for standing in the way of building public support for pipelines. "The problem is not the labour unions, it’s David Suzuki," Clement told members of the Alberta Enterprise Group. Suzuki also clashed with Natural Resources Minister Joe Oliver after the Tory MP used an open letter to accuse "environmental and other radical groups" of trying to undermine Canada’s economy by opposing pipelines. In a blog for HuffPost, Suzuki shot back that if caring about air, water and land makes him a radical then he would wear the label proudly. "While an investment banker like Joe Oliver or a former oil industry economist like Stephen Harper may look at Canada and only see numbers, we see a country rich in natural resources, wildlife, clean water, a diverse population of educated and caring people, and institutions that have been built up over the years to put the interests of Canadians first," he wrote. What do you think about Suzuki’s comments and Kenney’s reaction? Tell us in the comments below.